On June 15, London was right in early summer, with the whole city being luxuriantly green and cool. The residence of Ambassador Liu Xiaoming was extraordinarily lively and full of laughter. 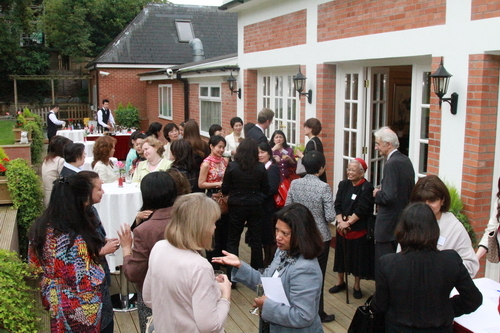 Members of British Pan-Asian Women’s Association from 14 countries such as Britain, India and Malaysia, as well as female diplomats and representatives of the women group of the Embassy of the People’s Republic of China in the United Kingdom of Great Britain and Northern Ireland,, totaling more than 50, were jointly present at the women reception hosted by Ambassadress Hu Pinghua. Among the guests, there were not only women from business circles such as senior bank executive and investment professional, but also female celebrities from all walks of life such as lawyers, architects, artists and journalists, who were like various kinds of flowers blooming in a garden. The similar Asian background and the common goals of safeguarding the rights and interests of women and enhancing women’s status in Britain urged them to draw close to each other. Though this was their first visit to the Ambassador’s residence, they felt at home because of Ambassadress Hu Pinghua’s warmth and hospitality. In three or fours, they wandered in the green garden, whispered in the elegant and quiet living room or appreciated the home accessories combining Chinese and Western elements. 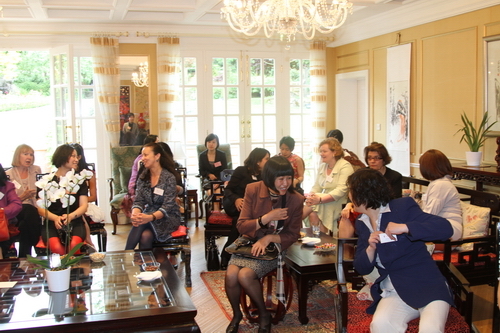 The members of British Pan-Asian Women’s Association had pleasant conversations with Ambassadress Hu Pinghua, female diplomats and representatives of the women group of the Embassy . The reception started after noon. 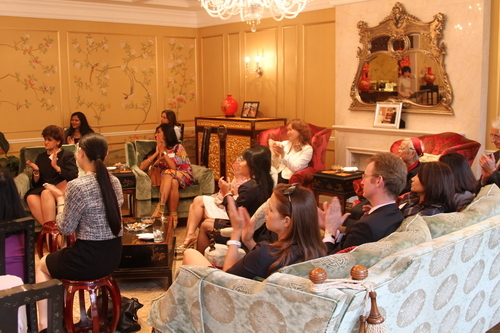 All participants sit in the living room and listened quietly to the speech made by Ambassadress Hu Pinghua. By comparing the present with the past and based on the six aspects, namely legal protection, politics, economy, education, family and health care, she gave a comprehensive and vivid introduction of the earthquaking changes of Chinese women’s status since the founding of the People’s Republic of China, especially since the reform and opening-up. Ambassadress Hu Pinghua said that, in the thousands of years of the history of Chinese feudal society, the social status of Chinese women was characterized by the concept that men were superior to women. The women then had no independent personalities and identities, to say nothing of rights and interests. But now, Chinese women legally enjoy equality with men. China has established a legal system for safeguarding the rights and interests of women on the basis of The Constitution and with the “Law of the People’s Republic of China on the Protection of Rights and Interests of Women” as the main body. In the past, it was an iron law that women should not intervene in politics. They had nothing to do with the national affairs and were excluded from the social political life. Today, instead of being conservative, old-fashioned and busy with housework, Chinese women are playing a more and more important role in the administrative decision of national and social affairs. The proportion of female senior officials has increased year by year. Now, there are 8 female state leaders, 3 female ministers, over 230 female provincial officials and over 600 female mayors and deputy mayors. The number of Chinese female diplomats has exceeded 1600, accounting for nearly one third of the total number of Chinese diplomats, and among them there are 8 female ambassadors and 19 consul generals. In the past, Chinese women possessed no independent income, right of ownership of porperty or inheritance. Today, the economic situation of Chinese women enjoys unprecedented enhancement. Employed females now account for over 40% of the total employees, higher than the world average of 34.5%. The policy that “men and women get equal pay for equal work” was carried out extensively nationwide. Women have fully displayed their capabilities in all industries. For example, some Chinese well-known enterprises such as Huawei, Haier and SOHO were taken charge by female principals. In the past, Chinese women were educated that “ignorance is a woman’s virtue”. The illiterate Chinese women had accounted for over 90% of the illiterates before the founding of new China in 1949. Today, with the support of the government and social organizations, the enrolment rate of school-age girls in Chinese elementary schools has reached 99% and that of girls in junior high school reached 95%. Chinese governments at all levels pay special attention to the development of adult education, vocatioinal education and illiteracy-eliminating education for women, and of women’s social adaptation and independence. In the past, Chinese women were constrained by “the three obediences and the four virtues” and oppressed by polygamy. Today, Chinese women enjoy equal rights of free marriage and divorce and do not have to bear the family names of their husbands after marriage. In over 58% Chinese households, the husband and wife made domestic decisions together, and in most households, they share housework equally. Domestic violence would not be tolerated. 62 years ago when new China was just founded, Chinese women just had an average life span of 36. Today, the Chinese government attached much importance to women’s health and continually increased the input for maternal and child health care. Over one third women below 65 can accept gynecological examination every year for free while elderly women could enjoy health consultation at regular intervals for free. The average life span of Chinese women has risen to 74 and the maternal mortality rate reduced from 15‰ to 0.34‰. Ambassadress Hu Pinghua pointed out that China is still a developing country and under the contraints of the level of social development and left-overs of feudal ideology, the status of Chinese women left much to be improved. For example, the overall quality of Chinese women should be further improved; there is lack of high-level women talents; women face the contradiction between career and family in real life and have to break down a variety of social resistance. To this end, Chinese government would continue to develop economy, tighten up the legal system, eliminate the conservative views of discriminating and despising women, and guarantee the comprehensive implementation of “equality of men and women” in social life. Chinese women should also respect, trust, support and improve themselves and take control of their own lives. 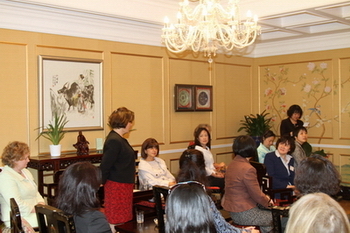 After the speech, Ambassadress Hu Pinghua also answered the questions from the guests. An Iranian-British scholar of international relation asked how Chinese government promoted the education for the girls in the remote poverty-stricken areas and the families of rural migrant workers in cities. Ambassadress Hu Pinghua first introduced the strategy of rejuvenating the country through science and education put forward by the Chinese government and the specific measures for implementing the nine-year compulsory education. Taking Gansu Province as an example and combining her own experiences, Ambassadress Hu Pinghua presented the great efforts the Chinese local governments have made for popularizing education for all children, especially girls. She expressed that it was the government’s objective and task to bring all the children, especially those in the poverty-stricken and underdeveloped areas, to complete the nine-year compulsory education. With the great attention of Chinese governments at all levels and strong support from all walks of life, most of the Chinese children, including the girls in the remote mountainous areas of Gansu Province, were able to complete the nine-year compulsory education and reach the junior high school level of education. It is believed that with the concern and support from the governments at all levels and all walks of life, the education for the girls in the vast rural areas of China and the families of rural migrant workers in cities would be greatly and increasingly developed. Ambassadress Hu Pinghua especially answered Korean artist Anna Paik’s questions on whether the Family Planning Policy in China resulted in gender imbalance and whether China should implement this policy more flexibly. She patiently gave meticulous explanations with regard to the misunderstanding and prejudice from the outside world. She pointed out that the Family Planning Policy is a long-term one made by the Chinese government according to the national conditions and population development. In the nearly 30 years since the enforcement of the policy, China had 400 million fewer births, which put back the reaching of 1.3 billion Chinese population and 6 billion world population for another four years. This was the positive contribution China has made for the world population and development. 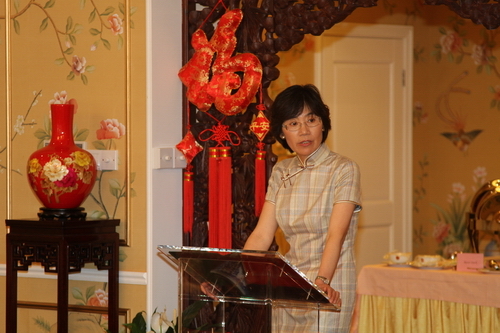 Based on detailed and accurate facts and data, Ambassadress Hu Pinghua indicated that it is biased to simply equate the Family Planning with the compulsory one-child policy and to regard it as the reason for gender imbalance and the Chinese government resolutely opposes and forbids any form of forced abortions and discrimination, maltreatment and abandonment of baby girls. Ambassadress Hu Pinghua admitted that the implementation of one-child polidy did bring the social problems related to the “inverted pyramid” family structure and the growth of the only child. The Chinese government has devoted itself to deal with the population problem as a whole and propel the sustainable social development through the economic development and sound public services and on the basis of insisting on the Family Planning Policy, keeping the birthrate low and controlling the rapid growth of population. The comprehensive, deepgoing and straight-out speech of Ambassadress Hu Pinghua aroused the resonance of the guests and won long and enthusiastic applause. Betty Yao, Chairman of the Pan-Asian Women’s Association expressed her gratitude for Ambassadress Hu Pinghua’s invitation of the members to the residence of the Ambassador and said that it was a pleasure to communicate with Ambassadress Hu Pinghua and the female diplomats of the Embassy and a special opportunity to understand the status and prospect of the development of the Chinese women. She expressed that she learned a lot and hoped for further exchanges with the Embassy of the People’s Republic of China in the United Kingdom of Great Britain and Northern Ireland. Founded in 2009 and possessing over 100 members, Pan-Asian Women’s Association focuses on carrying out all forms of charitable activities, enlarging the influence of the Asian women in Britain, making donations to girls in poverty-stricken families in Asian countries for education and providing education and vocational counsel for the Asian women in Britain.